Sqrft girls win division championship at HIC nail-driving competition. 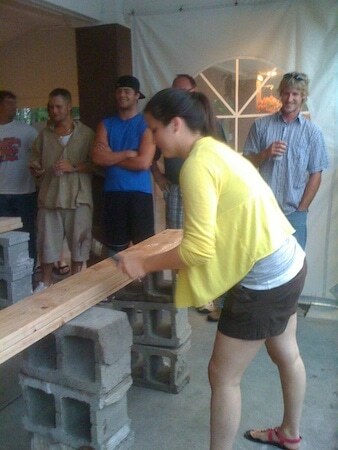 A surprising moment at the HIC picnic when it is announced that the girls of Squarefoot Tradesmen will be competing in the annual nail-driving competition alongside the seasoned carpenters and general contractors who were attending the event. As the girls stepped up to the boards, it is announced, “And now, the moment you’ve all been waiting for, the woman’s division!”. Sarah, Jenny and Brielle laugh and brace themselves to compete against the other three ladies at the picnic. Ready? Set? Go! And they’re off! Sarah struggles to pound in a sideways nail but manages the task quick enough and passes the hammer to Jenny, the veteran of the team. Her effort is flawless and she drives the nail in straight and efficiently. Wack! Wack! Wack! Repeat! Then, Brielle, the newest customer service representative takes the hammer. She is pounding her little heart out and yelling at the nail as a hault is called to the competition. Then it is decided. There will be a nail-off! Between Brielle, and one member of the opposing team. The stakes are not high and the mood is less than tense. And they’re off!! Finally, time is called. Both nails sideways, and not in the boards… Wait! A member of the crowd steps out, “I have an app for that!”. He proceeds to straighten each nail from the board and measure it. Then it is announced! An impressive win by Brielle in the first round by a mere tenth of an inch makes the Construction Personnel Group girls the champions of the women’s division! The girls will progress to the second round! The girls step up to the boards again and face a team of burly carpenter’s. Ready? Set? Go! Sarah starts up again and is hammering away when suddenly the mood changes and she looks up, “They’re done??!”. And so the girls are defeated. But the smiles and laughter do not fade from their faces as they embrace their title as the Women’s Division HIC Nail-Driving Champions!